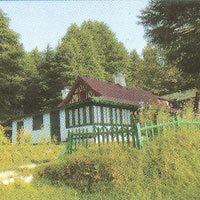 Dalhousie is a hill station full of colonial charm that holds lingering echoes of the Raj. Spread out over five hills (Kathlog, Potreys, Tehra, Bakrota & Balun) the town is named after the 19th century british governor general Lord Dalhousie. The town’s varying altitude shades it with a variety of vegetation that includes stately grooves of pines, deodars, oaks and flowering rhododendrond. Rich in colonial architecture, the town preserves some beautiful churches.Its marvelous forest trails overlook vistas of wooded hills, water falls, springs and rivulets. Like a silver snake finding its way out of the mountains, the twists and turns of river Ravi are a treat to watch from many vantage points. 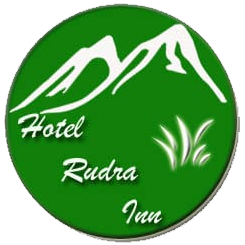 There are also magnificent views of Chamba valley and the mighty Dhauladhar range with its awe-inspiring snow covered peaks filling an entire horizon. A veneer of Tibetan culture has added a touch of the exotic to this serene resort and along road sides are huge rocks carved in low relief, painted in the Tibetan style. By road Dalhousie is 555Km from Delhi, 45 Km from Chamba and the closest railhead at Pathankot is 85 Km away. Subhash Baoli: A splendid walk from the main post office square leads up to this spring(2085 m) which also has some panoramic views of the snow capped mountains across. Satdhara: Close to the town(2 Km, 2036 m), and on the route to panjpulla are the seven springs of Satdhara, known for their medicinal properties. Panjpulla: A pretty sot (2 Km), where water from natural sourcesflows under five bridges. 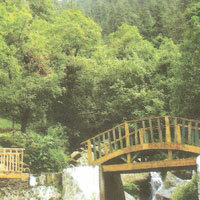 Bakrota Hills: A five kilometer popular walking circuit through Bakrota Mall, offering splendid mountain views. Kalatope: Set in natural surroundings, the forest rest house (8 Km, 2440 m) here with fine views makes for an ideal spot for a weekend retreat. The nearby sanctuary shelters a variety of wild life. Bara Pathar: Amidst thick woods is the small temple of Bhulwani Mata (4Kms)in the village of Ahla on the way to Kalatope. A fair celebrated in July venerates goddess. 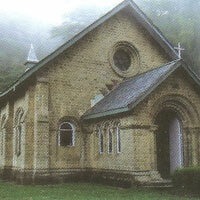 Dalhousie Churches: There are four churches in Dalhousie. Just 1.5 km from Bus stand, is the church of St. Andrew at Balun. This Church of Scotland was built in 1903. Another is St. Patrick’s Church at Balun, which is 2 km from the Bus stand. This was built in 1909. 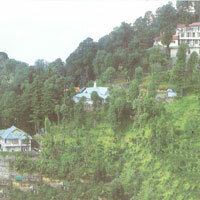 It is the largest church in Dalhousie. St. Francis’s Church at Subhash Chowk was built in 1894 and St. John’s Church at Gandhi Chowk was built in 1863. Dainkund: On a clear day this tall peak outside town (10 Kms, 2745 m) affords a birds eye-view of the hills, verdant valleys and the Beas, Ravi and Chenab rivers threading their silvery passage down to the planins. 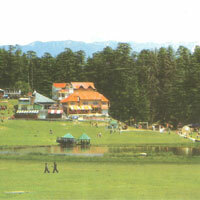 Khajjiar: While it is possible to go by road (22Km, 1960 m) this exquisite glade is just a pleasant day’s walk from Dalhousie. A picturesque spot with an emerald saucer shaped meadow amidst a dense forest which even has a lake with a floating island at its center, a temple with a golden spire by the way side and a golf course, makes for a perfect holiday setting in the mountains. Chamaba: Resplendent with historically and architectually important buildings, Chamba town in its temples and palaces preserves much of its rich medieval past. Perched on a plteau overhanging the river Ravi, the town is named after Champavati, a daughter of Raja Sahil Varma of the Bharmaur royal house who shifted his capital here in 920 AD. Isolated by high mountains in its beautiful valley, Chamba over the centuries was allowed to develop its own style of ‘Pahari’ art and architecture. Much of this heritage has been preserved and Chamba, known for the splendour of its temples and handicrafts, is replete with artistic masterpieces. Still intact a fine group of six ancient shikhara style stone temples (dating back to 8th century) are dedicated to Lord Shiva, Vishnu and other deities. Among them the richly carved Lakshmi-Narayan temple is the oldest structure. Other evidence of Chamba’s heritage can be seen in the famous collection of miniature paintings from the Kangra, Basholi and Chamba schools at the Bhuri Singh Museum, as well in the murals and other artifacts at the Rang Mahal Palace. Chaugan, the grassy meadow at the heart of the town, is also the center of its cultural activities. In July/August, each year, the Minjar fair is held here. Valley Gods and Goddess in their majestic palanquins are brought down from the mountains to pay homeage to Lord Raghuvira, the presiding deity of the valley. During the week long harvest fair, the ground comes alive as villagers in colourful dresses celebrate with sport, song, dance and music. The Hari Rai temple near the Chaugan (dating back to the 11th century) known for the four armed bronze statue of Lord Vishnu (Chaturmurthi) is a masterpiece in metal craft. Overlooking the town a little distance away, the temple of goddess Chamunda Devi has some of the finest wood carvings that adorn its exterior and interiors. Chamba is 120 Kms from Pathankot -(the nearest railhead), 390 Kms from Shimla and 45 Kms from Dalhousie. 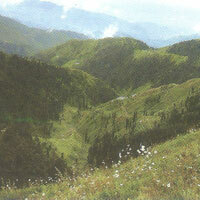 Devikothi: It is situated north-east of Chamba at an altitude of 2350 meter which is 107 kilometer from Chamba. The village has a spectacular view of snow clad peaks. It has a famous temple dedicated to Chamunda Devi, locally called Chaunda built in 1754 AD. The temple also presents a splendid wood carving wall paintings work done in Mughal Style.